This superb example of Soviet engineering is a delight to use and a wonder to look at. The maker is the ElectroInstrument factory in Voronezh, Russia (RSFSR in the former Soviet Union). ElectroInstrument was a Soviet military contractor, specializing in aerospace equipment and electronics. They survived the re-structuring of the USSR and now make televisions as well as their more specialized products. The first thing you notice about the Key-8 is the unique styling, which says immediately that this paddle is different. The body is polished chrome, and the base plate, machined from solid brass 3/8" thick, adds considerable weight-- this puppy weighs almost three and a half pounds! Somebody asked why they would use plastic parts on such a work of art, and hey-- guess what? The only plastic parts are the fingerpieces. The screws, lock nuts, and speed adjustment knob are all machined brass, laquered black. The paddle arms and contact posts are steel, again laquerred black. The base of the Key-8 is 4" in diameter and the height is 3", with the fingerpieces extending just over an inch from the front of the body. Paddle tension and spacing are independently adjustable, and the action is smooth and precise. There is a small amount of "tactile feedback" which makes it feel a bit like a magnetic paddle, but in fact it's all mechanical. The contacts are silver. The built-in electronic keyer is not iambic-- that is, squeezing both paddles will result in a string of either dits or dahs, not alternating dits and dahs, but instructions for bypassing the keyer (to use the paddle with an external keyer) are provided. The keyer is an interesting example of late-Soviet electronics, with some very foreign-looking ICs and components. 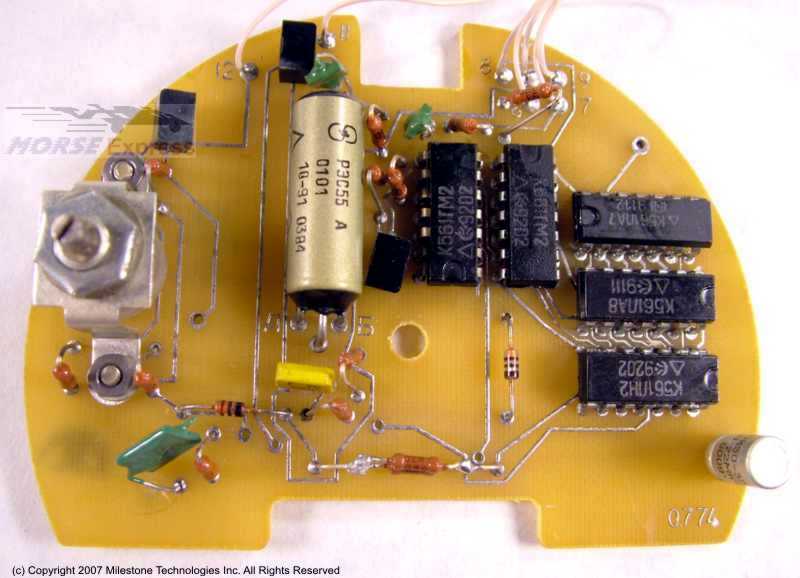 The board is a custom shape, with an unusual layout, but possibly machine soldered. 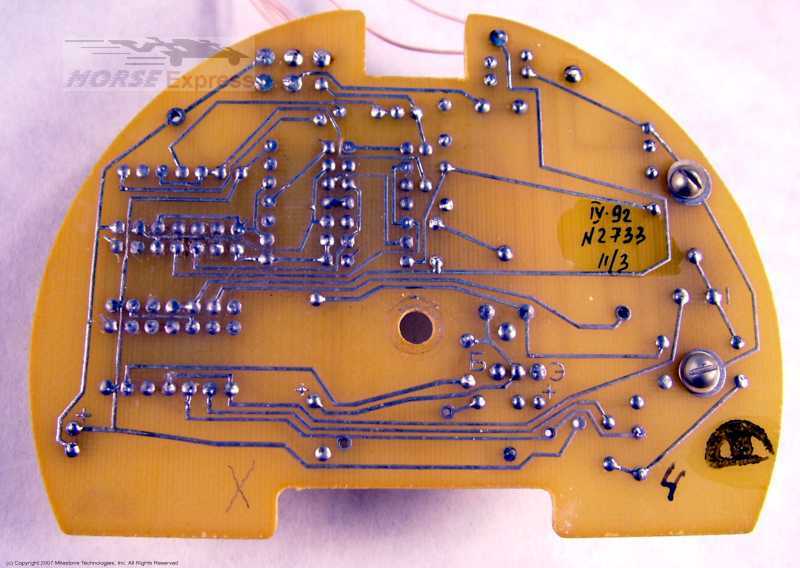 Click for an image of the component side or solder side of the board. The keyer requires +6-15VDC. 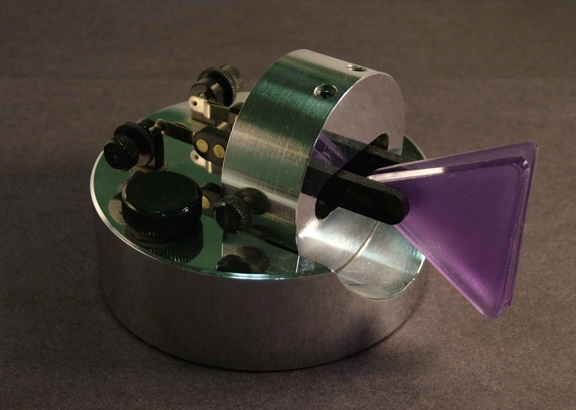 A side-tone oscillator is included, and the speed is set from a knob on the top of the body. Speed range is spec'd at 5-50WPM. Output keying is by means of an internal metal thread relay, so the key line is electrically isolated from the keyer and you don't have to worry about polarity or voltage (within the specified limits). All connections to the keyer are by way of a 5-pin DIN socket on the back of the base (we'll include a matching 5-pin DIN plug and wiring instructions). Instructions for setting up and adjusting the Key-8 with a couple more photos, are available here on the web site..
We've always supplied the Key-8 with a matching DIN plug, but we know they can be tricky to solder. We found some 3' DIN cables, with a molded plug on one end. The other end has stripped and tinned conductors for easy attachment to jacks or equipment of your choice. There are leads for power supply (+ and -DC), and for the transmitter key-line (which is relay switched, not polarized). 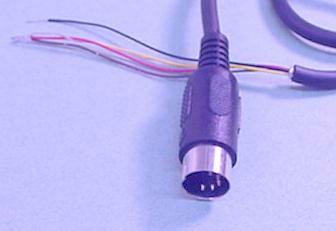 The audio output from the keyer is not connected, but if you are using the Key-8 with a radio which has a side tone, you won't need the keyer's audio. The KEY8DINB cable is $3.00, and comes with instructions (click to view in pdf format). If you are a user of the Key 8, your comments could be here! Write to us via the link below, and please be sure to say specifically that we can use your comments on the web page. of course, I played with it for about an hour to get it just right. that is completely different from any other key. visit but mainly because I like it so much. you the right amount of feedback. I've used mine right through the speed range and had no problems at all. from a great height onto soft earth ( another story). It's certainly very solid and highly recommended over the more flimsy types! but an ink jet just doesn't? Having a non-computerized keyer is a real treat. Especially one that sends good clean cw, and this one definitely does. nothing but top-knotch service. Thanks much.